Discussions Magazine Music Blog: IRIS DEMENT: An EXCLUSIVE interview! 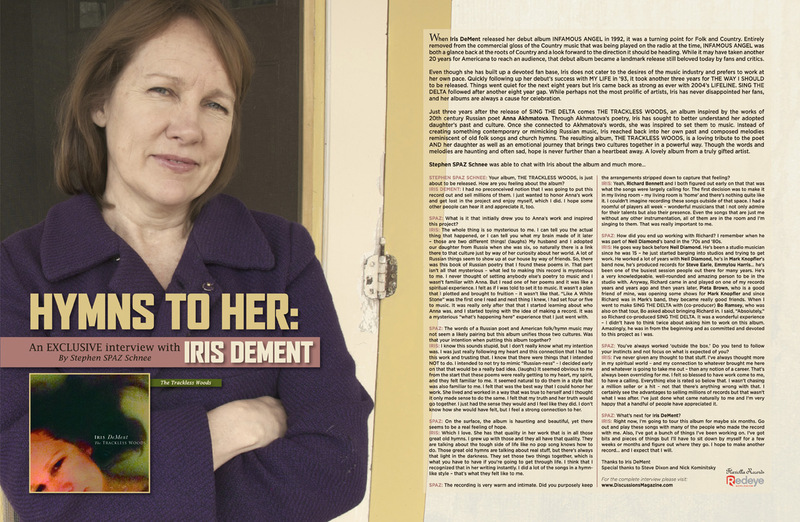 IRIS DEMENT: An EXCLUSIVE interview! When Iris DeMent released her debut album Infamous Angel in 1992, it was a turning point for Folk and Country. Entirely removed from the commercial gloss of the Country music that was being played on the radio at the time, Infamous Angel was both a glance back at the roots of Country and a look forward to the direction it should be heading. While it may have taken another 20 years for Americana to reach an audience, that debut album became a landmark release still beloved today by fans and critics. Even though she has built up a devoted fan base, Iris does not cater to the desires of the music industry and prefers to work at her own pace. Quickly following up her debut’s success with My Life in ’93, it took another three years for The Way I Should to be released. Things went quiet for the next eight years but Iris came back as strong as ever with 2004’s Lifeline. Sing The Delta followed after another eight year gap. While perhaps not the most prolific of artists, Iris has never disappointed her fans, and her albums are always a cause for celebration. Just three years after the release of Sing The Delta comes The Trackless Woods, an album inspired by the works of 20th century Russian poet Anna Akhmatova. Through Akhmatova’s poetry, Iris has sought to better understand her adopted daughter’s past and culture. Once she connected to Akhmatova’s words, she was inspired to set them to music. Instead of creating something contemporary or mimicking Russian music, Iris reached back into her own past and composed melodies reminiscent of old folk songs and church hymns. The resulting album, The Trackless Woods, is a loving tribute to the poet AND her daughter as well as an emotional journey that brings two cultures together in a powerful way. Though the words and melodies are haunting and often sad, hope is never further than a heartbeat away. A lovely album from a truly gifted artist. STEPHEN SPAZ SCHNEE: Your album, The Trackless Woods, is just about to be released. How are you feeling about the album? 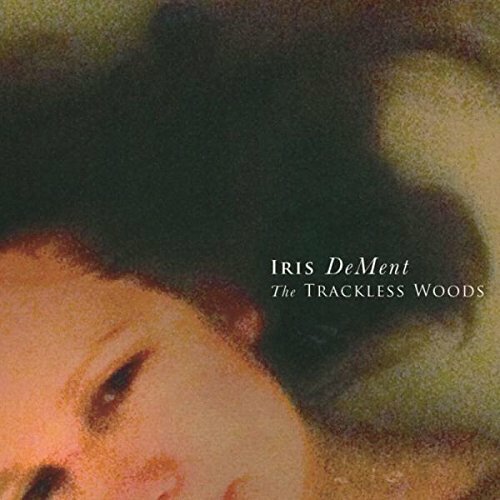 IRIS DEMENT: I had no preconceived notion that I was going to put this record out and sell millions of them. I just wanted to honor Anna’s work and get lost in the project and enjoy myself, which I did. I hope some other people can hear it and appreciate it, too. SPAZ: What is it that initially drew you to Anna’s work and inspired this project? IRIS: The whole thing is so mysterious to me. I can tell you the actual thing that happened, or I can tell you what my brain made of it later – those are two different things! (laughs) My husband and I adopted our daughter from Russia when she was six, so naturally there is a link there to that culture just by way of her curiosity about her world. A lot of Russian things seem to show up at our house by way of friends. So, there was this book of Russian poetry that I found these poems in. That part isn’t all that mysterious – what led to making this record is mysterious to me. I never thought of setting anybody else’s poetry to music and I wasn’t familiar with Anna. But I read one of her poems and it was like a spiritual experience. I felt as if I was told to set it to music. It wasn’t a plan that I plotted and brought to fruition – it wasn’t like that. “Like A White Stone” was the first one I read and next thing I knew, I had set four or five to music. It was really only after that that I started learning about who Anna was, and I started toying with the idea of making a record. It was a mysterious “what’s happening here” experience that I just went with. SPAZ: The words of a Russian poet and American folk/hymn music may not seem a likely pairing but this album unifies those two cultures. Was that your intention when putting this album together? IRIS: I know this sounds stupid, but I don’t really know what my intention was. I was just really following my heart and this connection that I had to this work and trusting that. I know that there were things that I intended NOT to do. I intended to not try to mimic “Russian-ness” – I decided early on that that would be a really bad idea. (laughs) It seemed obvious to me from the start that these poems were really getting to my heart, my spirit, and they felt familiar to me. It seemed natural to do them in a style that was also familiar to me. I felt that was the best way that I could honor her work. She lived and worked in a way that was true to herself and I thought it only made sense to do the same. I felt that my truth and her truth would go together. I just had the sense they would and I feel like they did. I don’t know how she would have felt, but I feel a strong connection to her. SPAZ: On the surface, the album is haunting and beautiful, yet there seems to be a real feeling of hope. IRIS: Which I love. She has that quality in her work that is in all those great old hymns. I grew up with those and they all have that quality. They are talking about the tough side of life like no pop song knows how to do. Those great old hymns are talking about real stuff, but there’s always that light in the darkness. They set those two things together, which is what you have to have if you’re going to get through life. I think that I recognized that in her writing instantly. I did a lot of the songs in a hymn-like style – that’s what they felt like to me. SPAZ: The recording is very warm and intimate. Did you purposely keep the arrangements stripped down to capture that feeling? IRIS: Yeah, Richard Bennett and I both figured out early on that that was what the songs were largely calling for. The first decision was to make it in my living room – my living room is ‘home’ and there’s nothing quite like it. I couldn’t imagine recording these songs outside of that space. I had a roomful of players all week – wonderful musicians that I not only admire for their talents but also their presence. Even the songs that are just me without any other instrumentation, all of them are in the room and I’m singing to them. That was really important to me. SPAZ: How did you end up working with Richard? I remember when he was part of Neil Diamond’s band in the ‘70s and ‘80s. IRIS: He goes way back before Neil Diamond. He’s been a studio musician since he was 15 – he just started barging into studios and trying to get work. He worked a lot of years with Neil Diamond, he’s in Mark Knopfler’s band now, he’s produced records for Steve Earle, Emmylou Harris… he’s been one of the busiest session people out there for many years. He’s a very knowledgeable, well-rounded and amazing person to be in the studio with. Anyway, Richard came in and played on one of my records years and years ago and then years later, Pieta Brown, who is a good friend of mine, was opening some shows for Mark Knopfler and since Richard was in Mark’s band, they became really good friends. When I went to make Sing The Delta with (co-producer) Bo Ramsey, who was also on that tour, Bo asked about bringing Richard in. I said, “Absolutely,” so Richard co-produced Sing The Delta. It was a wonderful experience – I didn’t have to think twice about asking him to work on this album. Amazingly, he was in from the beginning and as committed and devoted to this project as I was. SPAZ: You’ve always worked ‘outside the box.’ Do you tend to follow your instincts and not focus on what is expected of you? IRIS: I’ve never given any thought to that stuff. I’ve always thought more in my spiritual world – and my connection to whatever brought me here and whatever is going to take me out – than any notion of a career. That’s always been overriding for me. I felt so blessed to have work come to me, to have a calling. Everything else is rated so below that. I wasn’t chasing a million seller or a hit – not that there’s anything wrong with that. I certainly see the advantages to selling millions of records but that wasn’t what I was after. I’ve just done what came naturally to me and I’m very happy that a handful of people have appreciated it. SPAZ: What’s next for Iris DeMent? IRIS: Right now, I’m going to tour this album for maybe six months. Go out and play these songs with many of the people who made the record with me. Also, I’ve got a bunch of things I’ve been working on. I’ve got bits and pieces of things but I’ll have to sit down by myself for a few weeks or months and figure out where they go. I hope to make another record… and I expect that I will.